Volkswagen AG and Ford Motor Co. (F.N) will join forces to build pickup trucks, delivery vans and possibly more, putting old rivalries aside to work together and confront a rapidly changing auto industry. The pair is set to start delivering the medium-size pickups and commercial vans from 2022, creating what VW Chief Executive Officer Herbert Diess called “the strongest player in this segment.'' VW and Ford are also holding talks for joint work on electric cars, autonomous vehicles and digital services. The collaboration on trucks and vans will help cut development costs and better optimize factory capacity. But the carmakers still have more talks to carry out to pool resources so they can better compete with tech giants like Alphabet Inc.’s Google, which are plotting inroads with self-driving technology and digital services that have the potential to undermine traditional business models. Volkswagen shares were up 1 per cent Tuesday afternoon in Frankfurt, while Ford dropped 1.8 per cent to US$8.80 as of 11:10 a.m. in New York. The tie-up is set to improve operating results from 2023, the companies said. Jim Farley, Ford’s president of global operations, estimated annual pretax gains of about US$500 million from the agreed vehicle projects for his company. Diess was more vague, mentioning savings in the “three-digit” million range. "This is a toe in the water kind of deal," said Jeff Schuster, senior vice president of forecasting for researcher LMC Automotive. The jointly developed vehicles will primarily be for Europe, South America and South Africa, at least for now. Diess said he was “very open” to potentially sharing VW’s electric-vehicle technology called MEB in Europe and possibly China, a region where Ford’s business has eroded. The auto giants said they have more to discuss about new-technology collaboration and where they will work together around the world. For now, their collaboration excludes North America, where VW has long struggled to grow its namesake brand beyond niche status, despite its ranking as the world's No. 1 automaker. Last year, VW had just 2 per cent market share in the U.S. and is outsold by Subaru there. Ford, on the other hand, has racked up losses in Europe and watched its market share slide, prompting the Dearborn, Michigan-based manufacturer to map out thousands of job cuts in the region last week. To stay ahead in the sector’s generational shift, Volkswagen has allocated a record 44 billion euros (US$50 billion) in spending over the next five years, seeking to use engineering prowess and scale to halt the expansion of new rivals like Tesla Inc.
VW, based in Wolfsburg, Germany, said on Monday it will spend spend US$800 million to expand its only U.S. vehicle assembly site in Tennessee to produce electric cars for North American buyers as of 2022. That announcement got the White House’s attention. Ford has also started on an US$11 billion restructuring and earmarked a combined US$15 billion in investment toward electrified and driverless cars in the coming years. It’s not the first time VW and Ford have teamed up, with executives from both sides touting past projects including joint ventures in South America and Portugal. 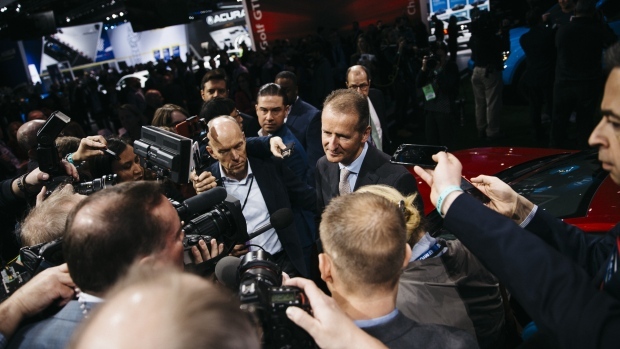 Under Diess, who took over as CEO last year, VW has pledged to change an often insular culture and become more open to working with other companies. The manufacturer’s last major alliance with Suzuki Motor Corp. ended in a London arbitration court before the first joint vehicle was built. Collaboration between global manufacturers is often beset by problems that stem from cultural differences, highly complex supply lines and production plans. Diess is determined that VW reap the benefits of its investments in e-car and self-driving technology, which may be an obstacle to greater collaboration with Ford, according to LMC's Schuster. "They want to control it," Schuster said of VW. "And that doesn't play well in an alliance." “You’d be pleasantly surprised how well these folks have worked together,” Hackett said on the call.